When it comes to plate armor, even the joints are deserving of good protection. 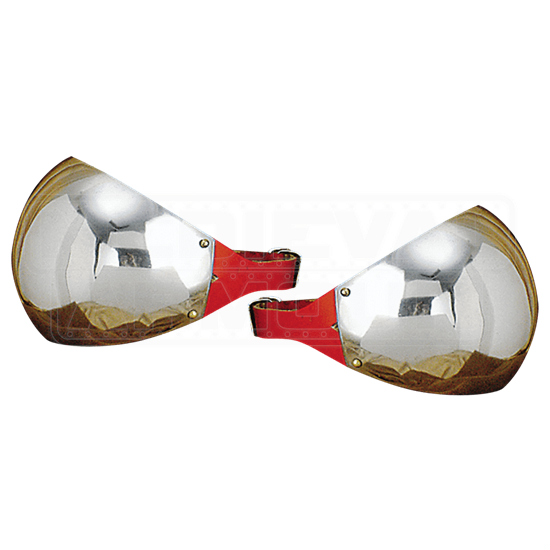 These Warriors Steel Elbow Guards are just such a point of protection that allows you to move your arm and use your elbow, while encasing it in a protective layer of steel. Based on the historical couter, this elbow cop is a curved mild steel plate that wraps around the elbow and is secured in place via a buckled leather strap. It protects the elbow from most angles of attack, while also leaving the arm free to move about, ensuring that it offers protection without detracting from the wearers range of movement. They are crafted from 16 gauge mild steel, which lends them a thickness that makes them perfect for use in costuming and LARPing, as well as in SCA events, reenactments, and more. Offered as a set of two, the pieces are fairly universal, with both fitting each arm easily. If you feel like your elbows are a proverbial chink in your armor, than these Warriors Steel Elbow Guards are the perfect way to eliminate it. Plus, they are a great pair of protectors that will go a long way towards increasing the authenticity of your medieval look, while also decreasing the likelihood of getting harmed by an errant strike.